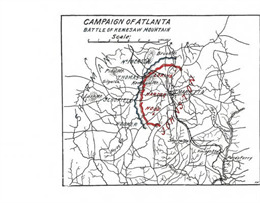 Map of the Battle of Kennesaw. Union troops are marked in blue, while the Confederate troops are depicted in red. View the source. At Kennesaw Mountain, Georgia, Confederate troops repulsed enemy forces, delaying the Union's advance on Atlanta. In the fall of 1863, Union troops had driven Confederate forces away from Chattanooga, Tennessee, and spent time preparing to invade the heartland of the South. When spring arrived the Union advanced 100,000 men toward Atlanta, Georgia, 120 miles south. While en route, the Confederates attempted to halt the advance through a series of battles and skirmishes, even though they were outnumbered 2-to-1. At the end of June 1864, with 20 miles left to reach Atlanta, Union commanders decided to try a frontal assault to devastate their opposition. 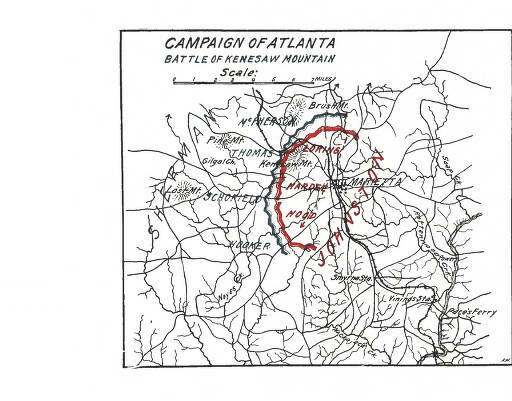 On June 27, they faced off against Confederate troops who had fortified Kennesaw Mountain (often spelled "Kenesaw" in contemporary sources) near the town of Marietta, Georgia. The decision to stop the Union march for an uphill frontal attack was a strategic mistake. The Confederates had positioned artillery on the heights and slaughtered the advancing Union troops. At some points, as many as 300 cannons were firing at once. The Union lost 3,000 of its 13,000 soldiers. After a truce to bury the dead, quickly rotting in the summer heat, the Union troops went around the mountain and continued toward Atlanta. The 1st, 3rd, 10th, 12th, 15th, 16th, 17th, 21st, 22nd, 24th, 25th, and 26th Wisconsin Infantry regiments, 1st Wisconsin Cavalry, and 5th and 10th Wisconsin Light Artillery batteries were all involved around Kennesaw Mountain in late June and early July. On June 27, the 1st Wisconsin Infantry fought for more than six uninterrupted hours.